Our client Eighth Day has gone live with a new video which was directed by Ethos public relations and filmed by Andreas Andrews Photography. 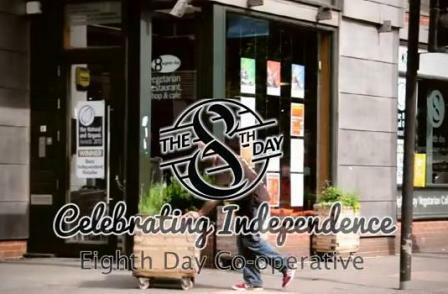 Eighth Day decided to commission a video for their website, which was filmed during Independents’ Day, an annual event to promote the UK’s independent retailers, to showcase the breadth of products and services they offer. Eighth Day café and shop on Oxford Road in Manchester stocks what is arguably the largest selection of organic and natural vegetarian and vegan foods in the North West. It has been trading for over forty years and was recently been awarded ‘Best Independent Retailer’ in the Natural & Organic Awards 2013. Ethos public relations has over 16 years’ experience of offering communications, marketing and media relations services to a wide range of clients and we have produced a number of online videos. To find out more about our video production services and to see other videos we have produced click here. An online video is a great way for your organisations to share its key messages and an informative, well-produced and fun video can really engage your key audiences. If you would like to watch the Eighth Day video click here. If you would like to find out more about how we could help your organisation with an online video, please contact us. This entry was posted in Eighth Day, Online video, Social media and tagged Eighth Day, Ethos PR, online video, social media, video production on September 4, 2013 by Ethos public relations news.